Curt Thomas serves as the Senior Pastor of The Renewed Church of Los Angeles. Under Thomas'leadership, The Renewed Church has grown from a weekly Bible study meeting to a vibrant, growing, progressive congregation. The Renewed Church of Los Angeles is an affiliate of the United Progressive Pentecostal Church (UPPC), under the leadership of Bishop Oliver Clyde Allen III, the presiding prelate and his mentor. In addition to pastoring, Thomas works with In The Meantime Men's Group, where he facilitates workshops and monthly groups geared at developing a holistic person in the LGBTQ community, especially to BLACK MEN. 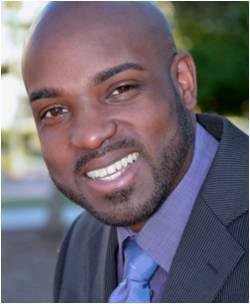 He also serves on the Community Advisory Board for CDC Youth Program housed at APLA Health & Wellness as well as a member of The Black Treatment Advocates Network (BTAN) through the Black Aids Institute. Thomas' diligence and passion for serving humanity has not gone unnoticed, as he is the recipient of notable awards for his accomplishments, which include the Bayard Rustin Award (December 2014) and the Congressional Award from Michael D. Antonovich. Thomas is a graduate of Stillman College in Tuscaloosa, Alabama where he received a Bachelor of Science in Education. He furthered his study in ministry by completing a certificate program with Interdenominational Theology Seminary in Atlanta, Georgia. He incorporates the knowledge and skills garnered from his studies in his approach to educating, counseling, andempowering his church members and community members at large. Pastor Thomas' greatest passion in life is to reach this generation with a cause. As a teacher and preacher, Pastor Thomas wants to use the calamities, social disparities, and struggles of his past to catapult people into their destiny. Curt's desires to encourage people to "never give up" on making their dreams a reality while living their authentic truth! He also desires to build a place where EVERYONE can come and experience the authentic love Jesus displayed in John 3:16.